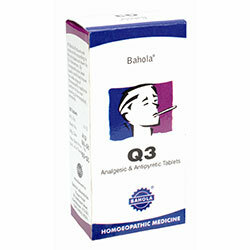 Q3 is an effective antipyretic, analgesic medicine for all types of fevers and their associated symptoms. Q3 bring down fever rapidly, alleviates accompanying body-ache, cold and coryza. The action of its individual constituents is as follows. 1. Arsenicum Album 3C : Fever with marked exhaustion, restlessness, associated symptoms such as sneezing, burning in eyes, acid nasal discharge, thirst for small quantities of water at short intervals. Fever as a result of food poisoning. 2. Belladonna 3X: Fever associated with extreme head, redness, throbbing and burning. Fever which are violent and sudden in onset. No thirst with fever. It is excellent medicine for eruptive fevers. 3. Bryonia Alb 3X: External coldness with internal heat. Headache, body aches are worse motion. Thirst for large quantities of cold water at long intervals calls for Bryonia. Fevers with hepatic complications. 4. Ferrum Phosphoricum 3x: Indicated in early stages of both inflammatory and catarrhal fevers. No side effects of Q3 are known. No antidotal and inimical medicines are used in Q3. It does not interact with the action of any other medicine.